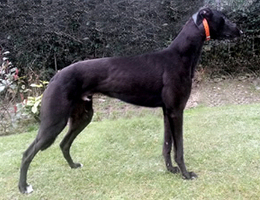 Bubbly Charlie has now retired from racing after a shoulder injury and is in a lovely pet home with one of the members and we would like to thank all the members that have helped us with our fundraising over the past 2 years. The Champagne Club Greyhound Racing Syndicate sold shares in a new pup they had named ‘Bubbly Charlie’. Each share donated £10 to the cause. All the shares were sold in a record time generating a total of £1000. We’d like to thank all the new owners of ‘Bubbly Charlie’ for their help.